Have a question on Fabia? Fabia is available in 9 different colors - Brilliant Silver Metallic, Black Magic Metallic, Pacific Blue, Cappuccino Beige Metallic, Corrida Red, Sprint Yellow, Denin Blue Metallic, Ralley Green Metallic and Blue Race Metallic. Watch latest video reviews of Skoda Fabia to know about its interiors, exteriors, performance, mileage and more. 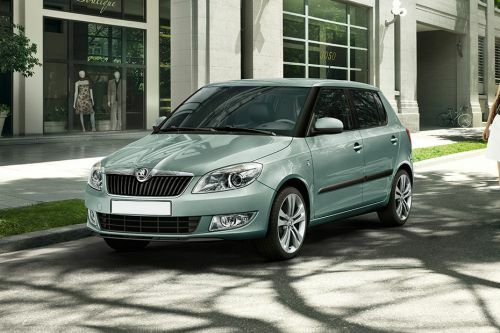 Skoda Fabia launched in its initial days was just a supermini car produced by Czech automakers Skoda. Following the concept of Skoda Felicia which was discontinued in 2001, Fabia was available in Hatchback, Estate and sedan body styles. Later on variants came-in and moved out of the market as per demand. Likewise the RS version sedan body was no longer produced & was replaced by Facelift version in 2010. But, RS 5-door hatchback trim never fell short of demand in the auto market of Skoda. Besides this variant, UAE residents also have option to choose Skoda Fabia Ambition. The interior styling of Skoda Fabia RS and Ambition differ a bit, nonetheless, both the trims have well-organized cockpit with sophisticated inner trim lining. More of the black color is fancied all over the cabin with silver/chrome highlights in the trim. Steering wheel is mounted with radio control, telephone switches and gear shifting paddles for improved handling & increased driver's control. Distinctive graphics can be seen employed on the dashboard in the form of dual big driver's information dials. Radio Swing, CD player, MP3, telephone connectivity, MDI (Music interface device), Bluetooth, CD card reader and radio Amundsen touch screen takes care of your fun hankering getting rid of the boredom. This compact car by Skoda has decorative exterior appearance embraced with the presence of tough and hard-looking bumper. The chrome detailing over black grille is decorated with company insignia in the centre. LED daytime running lights and round-shaped fog lamps ensures clearer visibility plus adds aesthetic value to its appearance. In RS trim different colors of roof are provided from which you can choose one increasing the visual appeal. One of the contemporary feature of SKODA cars is easily distinguishable rear headlamps located at the lateral corners. Standard 14-inch wheels in Ambition trim and 17-inch in RS comes fitted in the tyre size 205/40 R17 for the later one. Overall proportions of Fabia are measured as 4000 mm x 1886 mm x 1498mm (L x W x H) along with the wheelbase of 2465mm. After reworking on Skoda Fabia's powertrain output, it is equipped in top rated 1.4-liter TSI, in-lined 4 cylinder engine in Fabia RS variant that churns out maximum power output of 180 bhp along with the peak torque of 250 Nm at 2000 rpm. Mated with 7-speed DSG automatic transmission, it delivers acceleration figure of 7.3 seconds in clocking the mark of 0-100 kmph on speedometer with the top speed of 225 kmph. Decent mileage of 6.2 L/100km is offered by this engine variant driving in combined driving layout. The other trim of Skoda Fabia, Ambition is equipped in rather big 1.6-litre engine that generates power of 105 bhp and torque of 153 Nm at 3800 rpm. Coupled with 6-speed tiptronic transmission it gives speeding numbers of 11.5 seconds as acceleration and top speed of 185 kmph. You can cover 100 km distance with this trim car sipping 7.5-litres of fuel. Skoda Fabia comes outfitted in McPherson suspension in front axle with lower triangular links and torsion stabilizer & compound link crank rear axle that ensures smooth riding experience and better handling. Alongside, to keep vehicle in track not allowing driver to loose control over the vehicle several brakig & handling functions in coordination. Some of them are ABS, Electronic stabilization program (ESP), Engine drag torque control (MSR), Anti-slip regulation and Dual Rate. Side airbags for front seat passengers with belt warning light works as active safety system reducing the collision upshots. Electronic vehicle immobilization device, Headlight-range adjustment, Fire extinguisher mounted to driver's seat are other safety aspects linked with this car. Successfully restyled, Skoda Fabia became one of the complete cars on sale after its launch in UAE market. All credit goes to its sturdily built exterior body and copiously proportioned inner package. But looking after rivals like Suzuki Splash, feels like there is stiff competition in terms of versatility and practicality inside the cabin. What is the price of Skoda Fabia? On road prices of Skoda Fabia in starts from AED56,000 for base variant Ambition, while the top spec variant RS costs at AED79,900 . What are the colors options available in Skoda Fabia?